Team Smith: Viva La Mexico! Hit you up when we get back! We'll think of you while we are chillin' on the beach! have fun.... wish i could go! sierra is so dang cute. bring her by sometime to hang out. can't wait to hear about cancun!! Okay, I'm commenting here so I don't make anyone mad, but good golly that comment was not mean, it was STUPID!! That's what drives me bonkers!!! 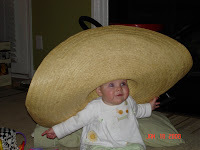 And I love the sombrero pictures!! Can't wait to see more! Sierra looks great in her somberro picture! I alsot got some awesome pictures of her and her cousin at Christmas from Leigh Ann. What a cutie! 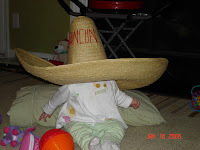 Have a blast in Cancun! Please send some sun my way, ha, ha. She is getting so big. Mexico? Is that place still around? these pics are so cute, that hat is drowning her.